A Healthier Build Your Own Nachos Bar is the perfect interactive party food. 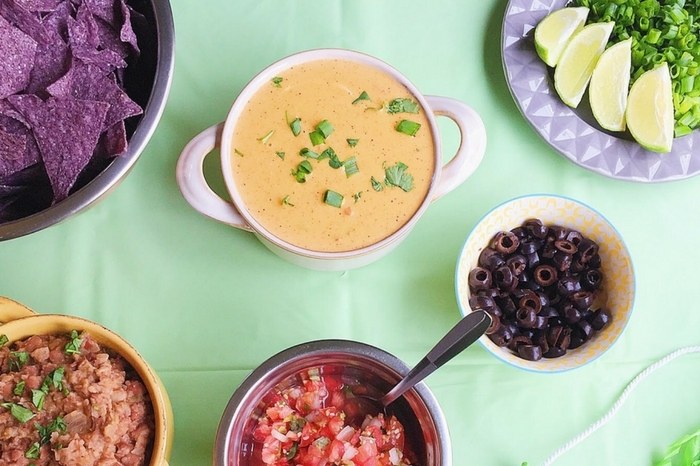 Whether you’re celebrating Game Day, tailgating, or hosting Taco Tuesday, craft this build your own nachos bar with creamy queso dip, refried beans, and GOODFOODS guacamole. 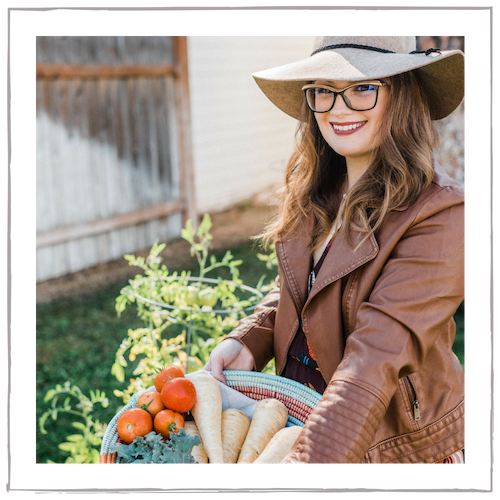 I’ve teamed up with GOODFOODS to #ShareTheGoodness for this post! Probably because I truly love cooking for people. I love crafting recipes, planning my menu, decorating, and bringing it all together. I even love the chaotic craze of rushing to get everything done. I especially love when people begin to eat and enjoy the food that I made. I love creating new memories with food, friends, and family as the backdrop. 99.9% of the time, I’m so busy in the kitchen at parties that I can barely enjoy my own guests. Or I’ve been cooking all day and I had barely any time to get ready, and now I’m exhausted at my own party (and I could have looked a lot better to boot). That’s why lately I’m all about simple, easy get-togethers. Good food really doesn’t have to be complicated, and it doesn’t have to take all day. Some of my favorite parties include the simplest ideas. Like my birthday a few years ago, where I let the slow-cooker do all the work in making tender, melt-in-your-mouth carnitas that got turned into an epic taco bar. 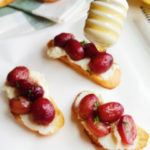 Or wine tasting parties with some simple warm appetizers (like these Roasted Grape and Ricotta Crostini with Lemon) and a giant cheese, charcuterie, and fruit board. And, lately: a Build Your Own Nachos Bar. This is such an easy, fun, and interactive food idea for any party. It’s especially fitting for Sunday night football, a Superbowl party, tailgating, or even a kid’s birthday. You don’t have to serve anyone. You don’t even have to do much cooking. Guests create their own combinations and help themselves. It’s a great conversation starter, and it doesn’t feel stuffy. 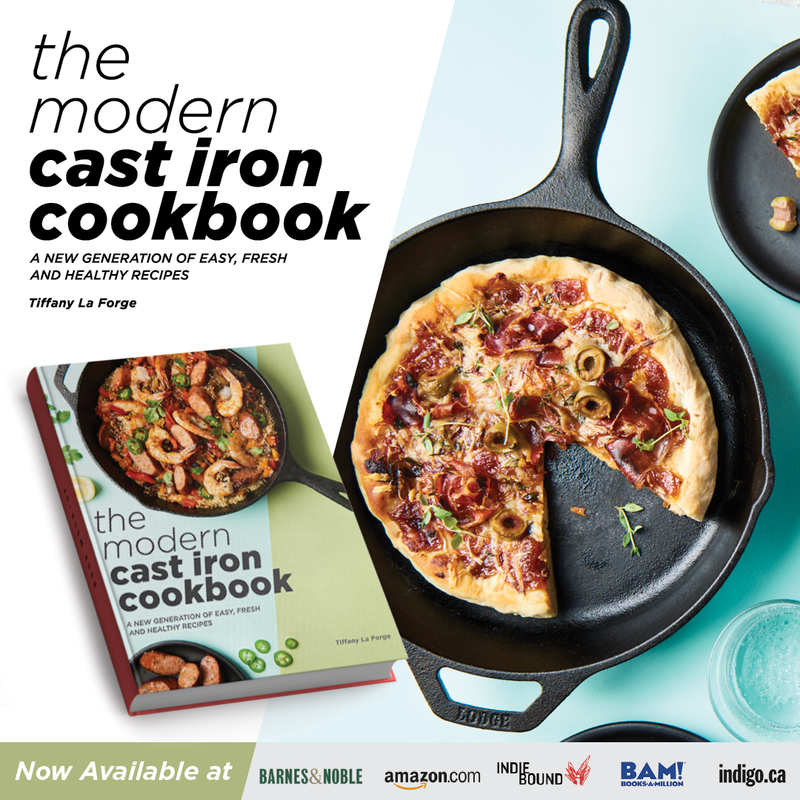 Most of the ingredients are going to be high-quality, store-bought items and fresh produce. But you’re going to cook two things: the queso and the refried beans. This is going to taste so much better than anything you can buy store-bought. Promise. And it’s going to be a little healthier, too. The queso dip doesn’t use any cream and it requires much less butter. Greek yogurt swirls in to make it extra creamy. The refried beans aren’t really fried at all, but they are so flavorful. 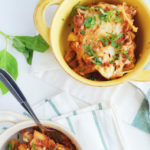 Full of spices, a little bit of bacon, and cooked down with chicken stock. They’re my absolute favorite, and they use organic canned beans as a short-cut. No soaking beans or cooking them for hours involved. And you’re going to use GOODFOODS Chunky Tableside Guacamole. Trust me on this one. This guacamole is by far the best store-bought brand there is. Every single person that tried it thought I made it myself. It tastes so fresh. 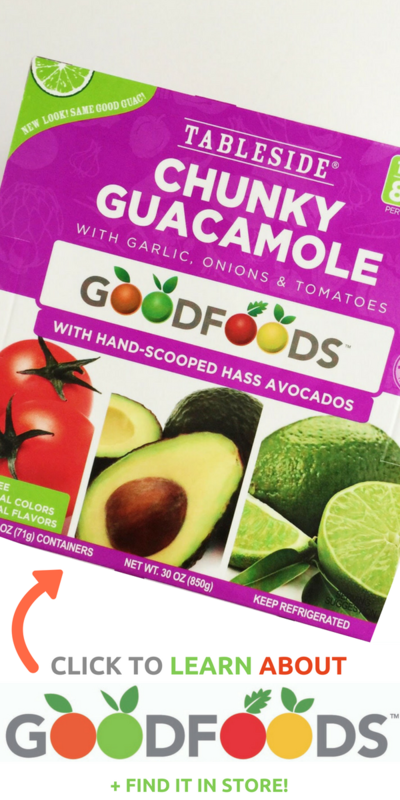 GOODFOODS makes guacamole, dips, salads, and juices. Simple, all-natural, and high-quality products without any additives, preservatives, chemicals, artificial ingredients, or colors. That’s a brand that I can stand behind. They use the power of water and cold-pressing to keep food fresher for longer and maximize the nutritional value. 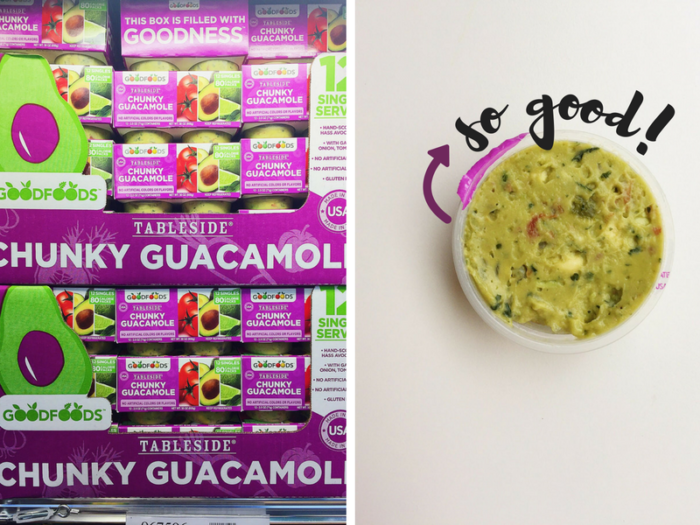 The GOODFOODS Chunky Tableside Guacamole is made with hand-scooped Hass avocados. 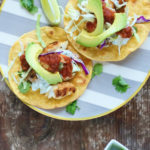 It only has five simple ingredients: avocado, tomato, garlic, onion, and fresh lime juice. Plus, they support the planet by turning their avocado skins and pits into compost! I love their Zero Waste initiative. I love this guacamole. There is no need to make your own for our Build Your Own Nachos Bar! You can grab a big container and scoop it into a bowl, or you can score some of the single-serve cups from Costco. These would be adorable decorated around the table, and the individual and sealed cups would ensure that the guacamole wouldn’t start to brown before your guests got to it. So, yes, I highly recommend using GOODFOODS guacamole and making this queso dip and refried beans. From there, mostly everything else can be store-bought or just simple fresh produce! The Chips: Your favorite tortilla chips. Try to stay away from the extra-thin or Cantina-style chips, as they tend to break too easily and not stand up to loaded nachos. I like using blue corn tortilla chips or even black bean, but a good variation would be great and give your guests some options. The Meats: Honestly, I don’t even use meats for mine and I let the refried beans provide the hearty, protein-portion of this dish. If you’d like to include meat, keep it simple with some spicy ground beef or chili-lime roasted, shredded chicken. Carnitas, shrimp, or chorizo would also be delicious. 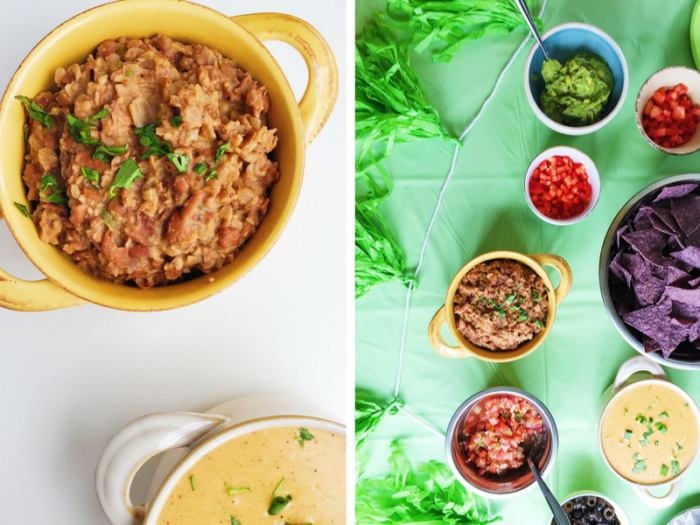 The Beans: These healthier, super-simple refried pinto beans! You could also add some drained, rinsed canned beans such as good ol’ black beans. 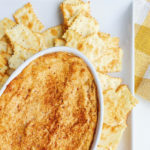 The Cheese: This cheesy, decadent (but a little less guilty) queso dip. 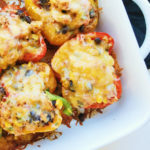 It’s a little spicy and so full of flavor, with fresh pepper, jalapeno, and tomato mixed in. You can make this dip with any milk of your choice, including coconut or almond. 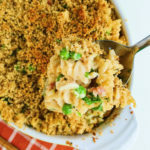 You can also put out crumbled cotija cheese, spicy Pepper Jack, or even vegan cheeses if you have more veggie-inclined friends. The Dips: GOODFOODS guacamole, fresh pico de gallo, a hot and spicy salsa option, salsa verde, or any of your favorite dips or salsas! The Fixin’s: Fresh chopped tomato, red pepper, olives, sliced radish, fresh limes, cilantro, cabbage, green onions, raw white onions, caramelized onions, fresh jalapenos, pickled jalapenos, chopped lettuce, etc. 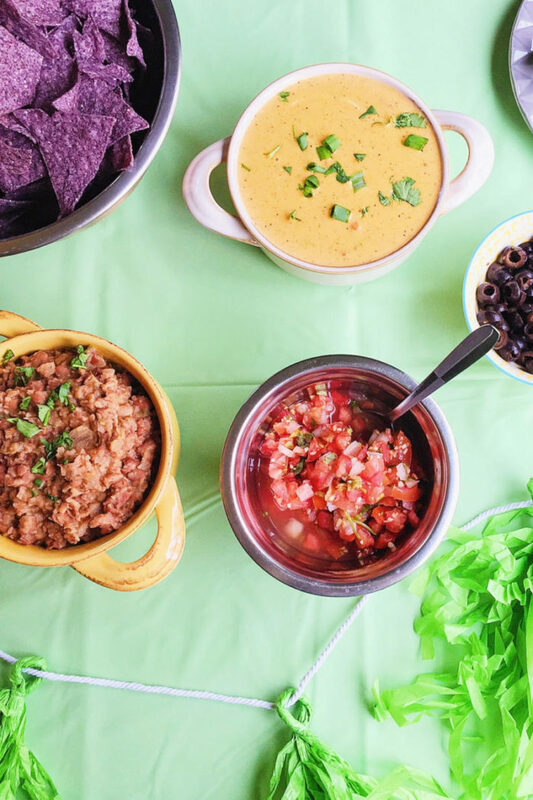 Creamy, cheesy queso dip and healthier, quicker refried beans make two great additions for a Build Your Own Nachos Bar. Melt the butter in a deep skillet. Add in the garlic, jalapeno, tomato, and red pepper. Cook to soften slightly. Sprinkle the flour over the mixture and cook, stirring, until the flour is golden brown, about 3 minutes. Slowly add in the milk while constantly whisking. Add in a bit of milk and whisk very well before adding more milk, ensuring there are no lumps from the flour and everything is silky smooth. Once all the milk has been added, bring the mixture to a simmer to thicken. Add in the chili powder, cumin, and salt and pepper to taste. Turn the heat to very low and slowly add in the cheese a few handfuls at a time, whisking well. Melt the cheese and turn off the heat. Stir in the Greek yogurt. Dice the bacon and cook until crispy. With a slotted spoon, remove the bacon and set aside, keeping the bacon fat in the pan. Add in the onion, garlic, and jalapeno. Season with salt and pepper and cook until softened. Add in the beans, chicken stock, cumin, and chili powder. Bring to a simmer. Add the bacon back in. With a potato masher or fork, mash the beans to your desired consistency. Garnish with fresh cilantro. Thank you to GOODFOODS for sponsoring this post and creating delicious, high-quality, and nutritious products! You can get your game day guacamole at your local Costco, Target, Sprouts, Publix, or Walmart! But GOODFOODS also sells their products at many other stores, so be sure to check out their Store Locator to find your favorite GOODFOODS products near you. 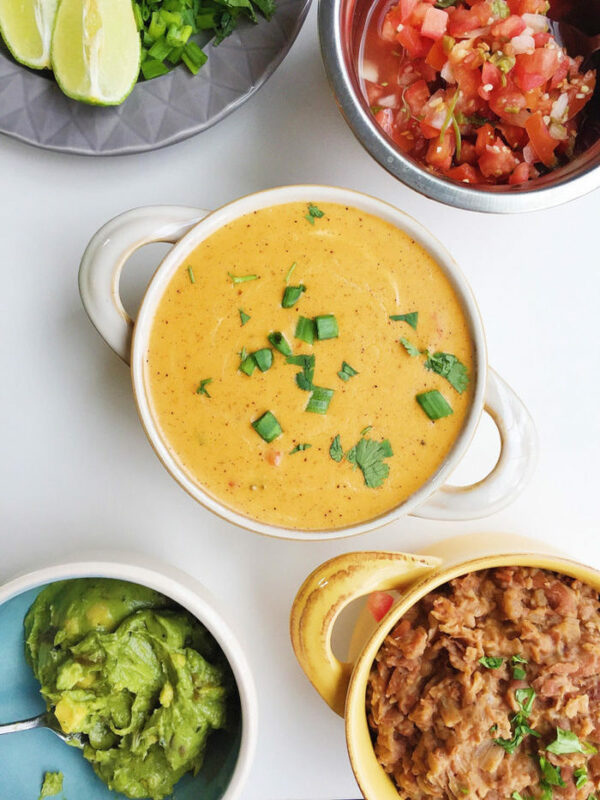 As a Brit, I have NO idea what queso is but I want all of this in my mouth, right now. 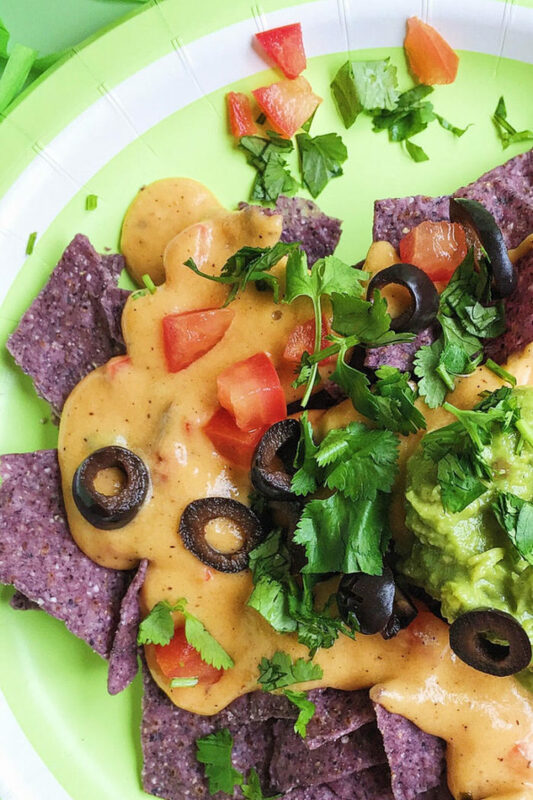 😀 I think that DIY nachos is totally the way to go when entertaining. It’s supposed to be enjoyable for you too, and nobody expects a la carte at house parties! LOL! Have you never had queso before?! Girl, you’re missing out! Give it a try! Thanks for giving me my dinner inspo for the night lol! Love this! I am having people over this weekend and I have been searching for good ideas. This is the one! So happy to hear, Colleen! Hope your guests enjoy the BYO Nachos Bar! Thank you, Anna! I love nachos, too. I’m addicted to this queso sauce! Mexican food is my favorite! So this nacho bar makes me hungry! I’ve never tried this guacamole, but it looks awesome! I’ll be looking for it at the store! I totally agree with you on enjoying my guests company & serving something that lets me give them my attention rather then working in the kitchen. This is a very nice idea, thanks. Thanks so much 🙂 Yes, it’s always better to actually enjoy your party! 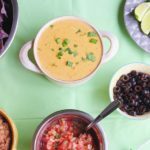 I love queso but stopped eating it because of all the calories, I must try your version! Thank you! Let me know what you think! Making it with almond milk definitely lightens up the calories quite a bit. I love the idea of a nacho bar! Such a great idea and to have healthy options is a must when hosting friends of all different diets! great great idea! Thanks, Bintu! I know you’ll love Goodfoods version. I agree that chunky guac is the best! OM NOM NOM NOM NOM NOM!!!!!! Let’s do this when I come up to visit!!! I can’t stop eating the nachos with the beans and cheese and avocado! It is so good. The best I have ever had and the guacamole is fantastic! This is going to be perfect for Sunday football!! !